Bartolameolli, Sally. 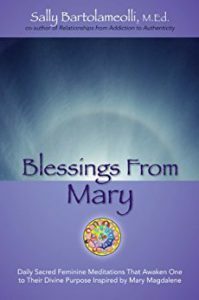 : Daily Sacred Feminine Meditations That Awaken One to Their Divine Purpose Inspired by Mary Magdalene.Denver, CO: Outskirts Press, 2010. Includes 365 Spiritual Meditations for daily inspiration; a description of nine Sacred Feminine Principles to explore and integrate; a Four-Step Process for deepening spiritual connection and welcoming Spirit Guides and Soul Partners; an authentic and vulnerable chronology of the human challenges that arise for the Spiritual Seeker; and guidance for discovering and honoring one’s Divine Destiny and Purpose. >>>Also available from Amazon UK.